The Goat Rock Roast was blended and roasted for you by Taylor Maid Farms. Certified Organic coffees from Peru, Nicaragua, and Sumatra were carefully chosen and blended together. A consummate cup well suited for any time of day, any season, and for any predilection. 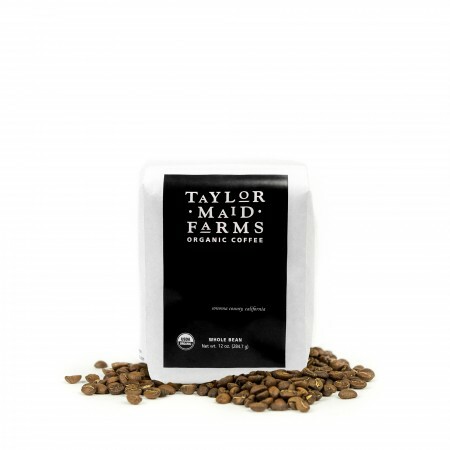 This coffee is perfect for its dark, balanced cup with notes of roasted nuts. A tad bit light for our tastes, but makes for a fantastic morning coffee! Definitely enjoy the flavor! very smoky and bold. not overly bitter. big finish. Decent. Could use more oomph but overall ok. Not distinctive, standard. Very nice, smooth, dark cup of coffee to start the day. smooth, very balanced, chocolatey. very good! I am enjoying it very much! I did move my grinder setting to the strongest setting to get a little deeper taste. There is no bitterness or oil. 2 shots pulled from a breville BES900XL dual boiler. still trying to get measurements correct to reach proper bar pressure. at 7 bars, crema is thick and very dark caramel in color. flavor profile is a little bit burnt on the front, with definite citrus notes and bitterness. i'm only tasting a slight roasty nutty flavor on the back end. it's definitely dark as an espresso. i don't own a regular coffee maker so i can't comment on that. Nailed it! This is a perfect cup. It's an interesting blend of beans, so I was hesitant at first. However, they read did an excellent job getting the right mixture and roasting just right. More roasts like this would be awesome. I'm very satisfied! I was a big fan of this coffee. It's fairly dark, but not exactly pitch black. I don't know about its crossover factor — whether or not it would be acceptable for those who prefer a light roast — but as a dark roast drinker, it was quite enjoyable for me. Milder than I usually like, but super well balanced. Easy to drink! Smelled awesome. Good taste, not overpowering. Perfect for a regular, everyday morning cup. Very good; we could try an even darker bean if there is one. Thanks! I'm not a coffee connoisseur, but I have enjoyed this coffee. Good everyday cup of joe. Not too dark, but has full flavor. Not a bad roast, just didn't stand out. It was ok. Great smell! Maybe a bit bland for my taste? Beautifully balanced and smooth. Great everyday morning cafe because it goes with everything! Smells bad but brews alright, not very rich tasting. Wife thought it smells bad as well but brews good. We liked this coffee though it was less full bodied or flavorful than what we are used to. Our favorite coffee by far out of all the months we have received so far! GREAT! Definitely a well balanced roast. I prefer the boldness of this roast of this coffee vs. the previous coffee. The nuttiness comes through with a hint of chocolate. Would like to roast to be slightly darker. This coffee is smooth, bold with dark beans that are a bit oily. There is little acidity - 1000x better than the blue heeler blend! It'd be awesome if the next batch were a bit more chocolatey, but this coffee was definitely in line with our taste in coffee! Thanks! hi Seth! it was pretty good but a little dark for my taste--i usually like coffee with citrus notes and lighter flavor profiles. These beans were dark and glossy--I usually buy beans that are light brown with no gloss--not sure if that makes a difference. Maybe I should try single origin? let me know what you think. This coffee is way too dark for my taste. I had indicated that I don't like dark roasts when I set up my profile so I'm not sure why this was sent to me. I intend on giving the rest of the bag away; I really can't drink it, unfortunately. It was good, but a little boring. I prefer darker, richer coffee. Really great coffee. Strong. Bold. Love it. Brewed very thin.. watery, almost straw like notes. Wasn't very impressed. I drink my coffee black. I need a robust, bold, darker, thicker consistency. so smooth and balanced! Loved this one!! The coffee was ok, but there was too much of an oily aftertaste that left a coat on my tongue. Very balanced. All the notes are great, but my ideal cup would additionally have some strong chocolate or earthy notes. Nice, dark roast organic coffee. Not a lot of nuance or subtlety, just a bold, robust, and rich flavor. Well balanced for sure - nothing "signature" about it, but definitely a treat still to look forward to. My less familiar coffee friends did enjoy a cup for it's very palatable appeal! I liked the coffee, I think maybe the nutty part of flavor detracted a little bit for me. I really enjoy dark roasted coffee, this blend was perfect. I recently purchased a Chemex and am so happy my first brew was with this delicious coffee. This coffee has a nice flavor but is not a dark roast in our opinion. I tried using twice as much ground coffee to make it richer but that doesn't even work. This should be classified as a light to medium roast. If you like dark you will be disappointed. If you want a plain good coffee look no farther. This will make a great pot of coffee no matter how you brew it, rather pour-over, press, or otherwise.In short; If you just want coffee that doesn't try to be anything else besides just a great cup of coffee, this is it. this tasted almost like stale cigarettes. for the first time ever, I didn't finish the bag. not a fan. Good flavor when really hot, but the flavor sort of "sours" as it cools. This is my second favorite coffee so far (1st was Equator’s Panther Blend). It proved to be a reliable, tasty and rich cup. With an Aeropress, it yielded a toasted, woody/nutty flavor. Delicious. This one is pretty good overall. I expected a little more from this one based on the roaster review, but it was a bit flat for me. I am still willing to drink it, but I just expected a bit more. Beat coffee I've had yet here. Great dark flavor. Very deep. No smoke. Rich and full. Enjoyed it. Strong and earthy, nutty. Great full bodied blend. Thoroughly enjoyed this coffee. My only criticism is that it was a little bit on the bitter side. Solid blend. Tastes great when brewed with a french press and stands up well to being mixed with cream. Nice rich flavor. I really like the taste of this blend. Very enjoyable. I really like the nutty flavor a and the smooth taste. Smells great, but the finish is weak, kinda muddy. I'm not loving it! Dark, robust with hints of chocolate. Loved it! These beans are wonderful, oily, rich, dark beans with a refined flavor - my favorite so far from Mistobox roasters. I found this particular brew to be a little on the bland side. Perhaps I got a bad batch, it had a stale taste to it. Excellent dark, smooth blend - my new favorite! I'd give it a 3.5 if I could. It's tasty, but maybe just a bit earthy for me. This was a nice darker roast. It didn't punch me in the face, but I liked it! Best one yet. Dark roast - substantial working man's coffee. Sorry light roast citrusy loving hipsters. Keep it coming. Had a very good flavor to it. Very robust and good depth. More what I'm looking for. Full body dark roast. There's no floral taste, which I don't like. Good cup of coffee. Overall the coffee is smooth, but it's also unremarkable. We aren't into coffees that want to slap you in the face with flavor or aromatics, but this one seemed way too mild. It didn't really taste like coffee. But, it also didn't taste like dirt or other things that some of our other experiences have been. Very smooth and balanced with low acidity. Chocolate notes and roasted chestnut. This is a very good blend and I enjoyed it. I still like to explore other coffee profiles with more pronounced characteristics on the edges of the spectrum, but this is a great blend to return to after the exotic trip! Perfect dark roast blend. Smell is amazing and taste is perfect-strong yet not bitter at all. This has a nice flavor to it. Not too bitter and not fruity. Seemed like a smooth nutty flavor. Good coffee for a daily cup but a little too plain for my liking. Flavor isn't bad but nothing really stands out about this coffee. Very balanced, not quite as oily as I usually like. This coffee was delicious! By far the best I've gotten thus far. So, so good! The flavor is not complex, but it has a flat and solid smoky taste, and also pretty good crema for a regular espresso shot. That said, if you are a dark roast lover, this one would be a pretty safe experiment. This was the eat one yet! Rich and bold. A very good subscription start! Definitely one-upped my last few purchases . . . waiting to be BLOWN AWAY by someone's coffee though . . . Beans were a rich, milk chocolate brown, and surprisingly oily given the medium roast coloring. Ground coarse, brewed in French press. Mouthfeel was light-medium, would have preferred something fuller/heavier. Smell and taste were quite earthy, a little nutty, not very robust, bold, or rich. Overall, rather middle-of-the-road. This is a pretty standard coffee. It's smooth, but lacks anything that makes it unique or me wanting more. a dark roast with a nutty flavor. A good single flavor coffee without complex flavors. Very good coffee, looked to be a blend of multiple roast levels. It seemed like more of a morning coffee, not dark but flavorful. all-around good coffee. medium roast. easy drinking with some bitter notes. I liked this. It was very smooth and very dark. It didn't stand out as anything spectacular but nothing to complain about. Love this coffee. Bold but not better. Crisp finish. Taste was okay but very mild. It didn't have the nice punch of dark coffee I like. I liked this coffee a lot. Its dark its intense and makes great espresso. beans are bigger, dark and very oily. Finally I get a bag I really really liked and I am enjoying it a lot. There is no burnt after taste or anything that disturbs your taste buds. I will be reordering this one immediately and frequently. If you like a dark roast, this is the one to get. Side note: I've never seen a coffee bloom like the one this delivers. Mesmerizing. Mellow cup of coffee. Not as bold as I would have liked. "Simple and straightforward" pretty much sums it up. This would be safe to serve to a wide variety of people. I drink coffee to look forward to something, not play it safe. Good choice for a 2nd shipment, for the 3rd I want something darker and bolder please. Coffee had absolutely no flavor except for a slightly bitter finish. Also no body; as thin as drinking water it was steeped in. Were able to finish the Chicago House Blend despite not loving it, but this one we'll just be bypassing. Really enjoyed this. Good body and strength - maybe just a touch too bitter. Is it possible to also have the next one ground for a french press?thank you! I really enjoyed this coffee. The dark nutty flavor is not too chocolatey, and the richness is just right. I also found it easy to prepare with the flavors being consistent. Not bad, a little dark for me. The more I drink it though the better I like it! Not my favorite coffee, not bad, just not my favorite, very dark with a hint of something I didn't like that was almost acidic tasting? I needed to put milk in this one! So - there's a trend here. 3 five star ratings in a row! Even opening the package of the Goat Rock Roast Organic is a treat. The beans are black, rich, oil like and the aroma is seductive. Using a medium grind, the coffee swells up like a small volcano when the hot water hits. A spectacular brew. Full flavored bloom that lasts throughout the entire swallow. It hits the tongue smooth, but seriously full - and the aroma stays flavor full in the mouth after the drink. This is a spectacular find. Definitely a repeat. I like this coffee a lot. It has a subtle yet flavorful roasted nut flavor. Dark and rich.